LLR69516 : Lorell Lorell High Back Executive Chair - Leather Black Seat - 5-Star Base - 27" Width X 30" Depth X 46.5"
Lorell High Back Executive Chair - Leather Black Seat - 5-Star Base - 27" Width X 30" Depth X 46.5"
Leather High-Back Chair Offers Bonded Leather Upholstery And A Gunmetal Finish On Arms And Base. Armrests Are Padded For Comfort. Functions Include Pneumatic Seat-Height Adjustment From 19-24/49" To 22-5/21", 360-Degree Swivel, Tilt, Tilt Tension And Tilt Lock. Mid-Back Chair Also Features A Five-Star Nylon Base With Hooded Double-Wheel Casters. 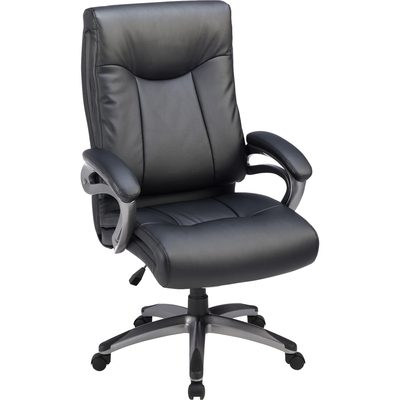 Capacity Is 250 Lb..
Leather High-Back Chair Offers Bonded Leather Upholstery And A Gunmetal Finish On Arms And Base. Armrests Are Padded For Comfort. Functions Include Pneumatic Seat-Height Adjustment From 19-24/49" To 22-5/21", 360-Degree Swivel, Tilt, Tilt Tension And Tilt Lock. Mid-Back Chair Also Features A Five-Star Nylon Base With Hooded Double-Wheel Casters. Capacity Is 250 Lb.